The vacuum chamber, circled by high strength magnets, could produce the first fusion-based propulsion prototype (Credits: University of Washington/MSNW). One of the most challenging aspects of sending humans to Mars is the duration of the flight that takes them there: over 500 days of putting up with the same crewmates while being barraged by cosmic radiation. It’s enough to make anyone stay in Earth orbit. But a group of researchers at the University of Washington is determined to go one better: they want to shorten the trip to Mars to a mere 90 days. How? With fusion-based rockets. “If we can pull off a fusion demonstration in a year, with hundreds of thousands of dollars … there might be a better, cheaper, faster path to using fusion in other applications,” John Slough, a research assistant professor of aeronautics and astronautics, told NBC News. That would appear to be a pretty big “if.” Scientists have been banging their heads against the fusion problem for decades. Everyone knows it’s theoretically possible to produce energy by fusing the nuclei of two atoms together – the Sun and stars manage it, afterall – but no one has ever been able to reproduce the feat in any sort of practical way. Slough and his colleagues have an idea that just might bridge that gap – and the US Department of Energy and NASA think they might be onto something, to the tune of a $600,000 grant. 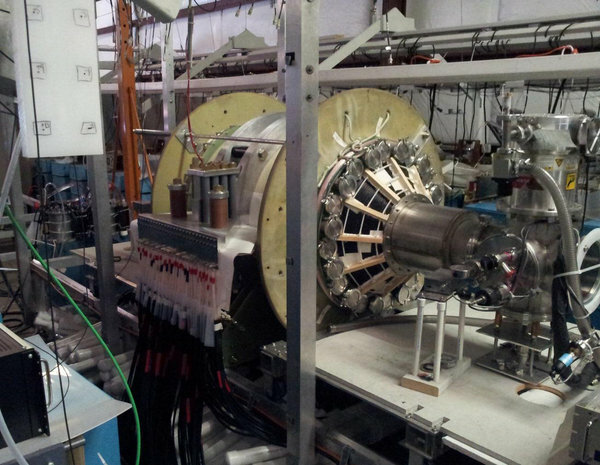 This summer, the University of Washington Plasma Dynamics Lab will be hosting a series of experiments using fusion to shoot hot, magnetized plasma at 30,000 meters per second in a given direction. If such a system could be installed on a spacecraft….well, you’d be getting to Mars a whole lot faster than anything will take you there today. The idea is to send metal ringlets into a magnetic field, causing them to collapse around a drop of deuterium. The deuterium undergoes compression that, for a few millionths of a second, exceeds nuclear forces. Fusion ensues with an explosion that spews the metallic rings outwards in the form of plasma. The magnetic field channels the plasma unidirectionally to achieve the aformentioned 30,000 m/s spray. Slough explains that this isn’t a great leap forward for fusion research; it’s just that no one ever figured out how to capture the energy produced in that explosion and turn it to something useful. While Slough and his crew may be about to fill that creative gap, there’s still a long way to go before a person rides that reaction to the planet next door.